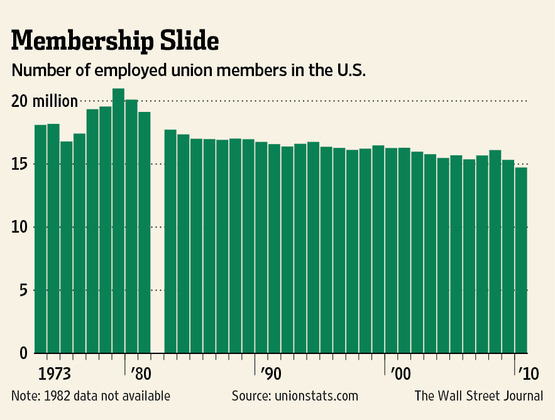 Union membership has steadily declined for decades. Membership peaked in 1979, with over 20 million union members. 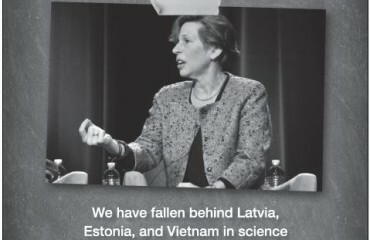 Today, less than 15 million members remain—less than half of which are in the private sector. In light of the recent push for labor reform and right-to-work laws, combined with unions’ dwindling membership, labor leaders are fighting for a last chance at relevancy and control. 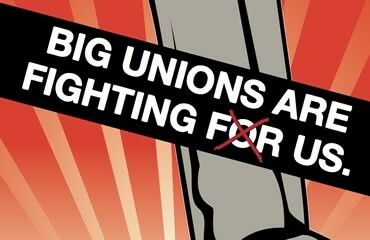 The AFL-CIO is attempting to revive its image with a new advertising campaign. The Wall Street Journal reports that the $1.5 million campaign featuring 30 and 60 second television ads has begun, airing in Pittsburg, PA and Austin, TX. The awkward ads attempt to show how everyone is connected by organized labor, but what they obviously don’t show is all of the people who are forced to be connected to unions in non-right to work states. Public sector unions in Wisconsin, with the help of their national unions, are also engaged in a fight for their life, as they desperately attempt to rid the state of Gov. Scott Walker. Last year Walker championed a bill that limited state employee collective bargaining rights, leaving union leaders seething. With the current standoff in Indiana over right-to-work leaning in its opponent’s favor, the unions’ survival skills will again be tested.